The neat rows of grapevines glistered in the afternoon-sun as I slowly rose up the slope towards 4 gabled structures. I was delighted to see that the climbers, albeit only 4 feet in height, extended as far as my eyes could see. I couldn’t help but feel excited. This was, after all, my first trip to a vineyard! 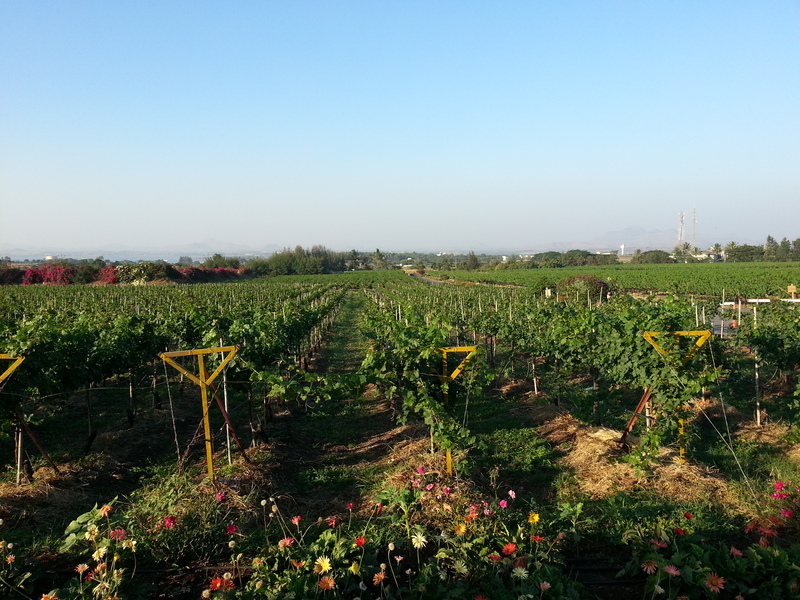 I had picked an opportune time to visit the Sula Vineyards as I not only beat the tourist-rush of Jan-Mar (the harvest season), but also experienced the beauty of Nashik in the light chill of early December. Nashik is about 3 hours from Mumbai, and the cheapest way to get here is by train. There are plenty of buses and cabs too that ply. I stayed at Ginger Hotel which is only 20 minutes from the winery. 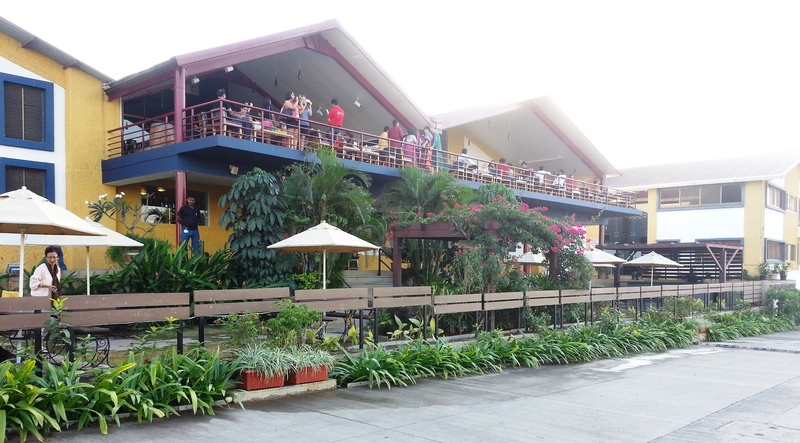 Sula also has its own resort on the estate. 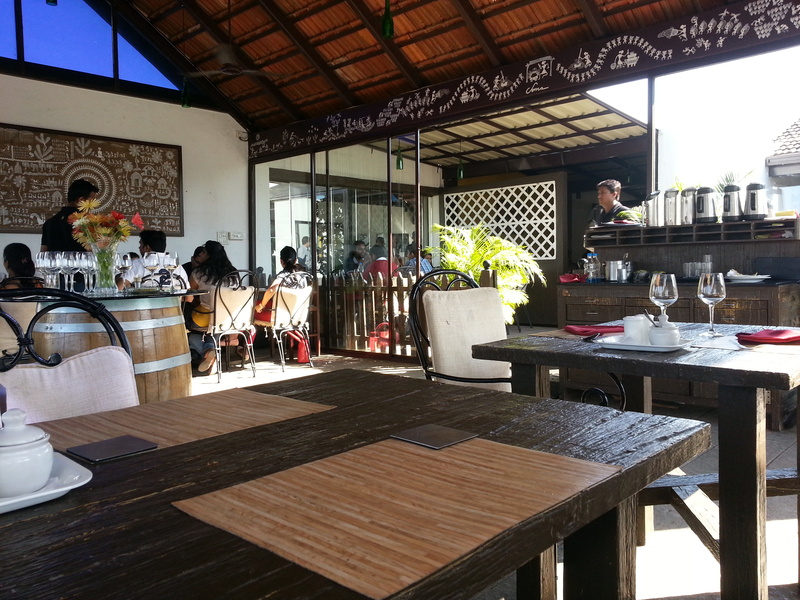 It was late afternoon when I reached the Sula property and made my way to their exquisite Indian restaurant – Soma. 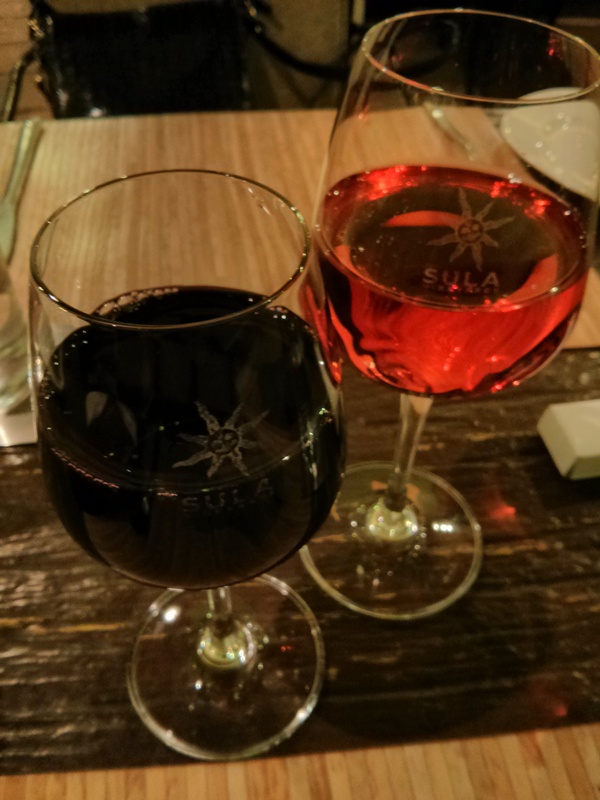 I glanced through the wine list and ordered a Sula Seco with some appetizers. I took in the interiors as I waited for my first wine of the day. The place is elegantly furnished with wood and wrought iron, and Warli-artwork graces the walls. My sparkling wine arrived with my choice of appetizers – cottage cheese balls and papad. This subtly sweet wine paired well with the spicy vegetable dish and tandoori rotis I ordered for the mains. With lunch behind me, I headed to the reception at the tasting room and bought my pass to the wine tour. A charming young lad sporting a black Sula-tee was our wine-tour-guide. He told us about the history of the vineyards and how the founder, Rajeev Samant, quit his job in Silicon Valley and started up the winery with some help from a Californian winemaker. The grapes used for producing wine are different from the regular grapes (table-grapes) we consume. Our tour began at the crushing pad where grape-juice is squeezed out of the harvested grapes. Grape-crushing has gone huge technological changes since the basket-press-days of yore. Popular activities like wine-stomping (with bare feet) have lead many to believe that’s an integral part of winemaking, but one can’t be further from the truth. If the thought of dirty, stinky feet romping about in a basket full of grapes makes you wretch at the wine you’re drinking, you can heave a sigh of relief! Most commercially produced wines have hardly any contact with the human-skin. 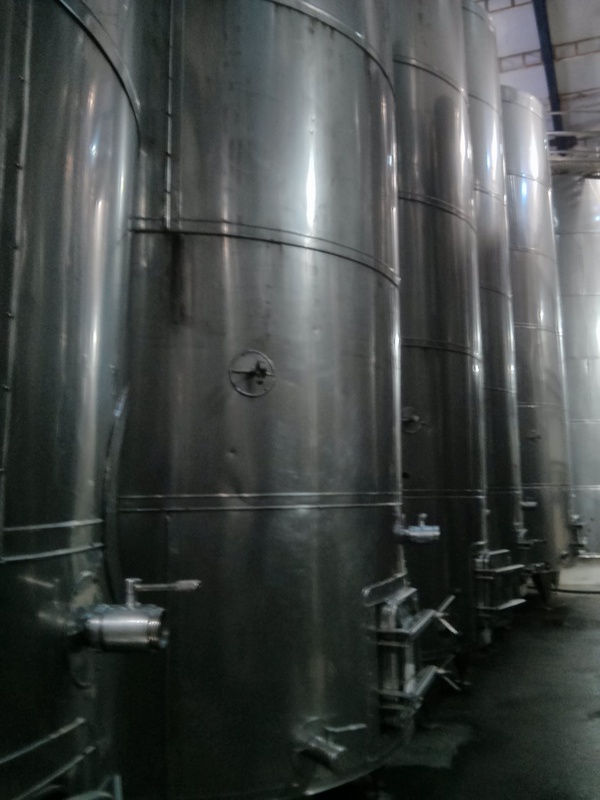 After extracting the grape-juice, your wine (to-be) is stabilized and filtered inside humongous stainless steel wine-tanks installed in a large, cool room called the tank hall. This is where you decide what wine you will produce! White wines are left as they are; for the reds, the grape-skin and twigs are added to the batch; and for rosé (pink wines), very little red wine is added to the white (mostly in 20-80 or 30-70 ratios) depending on the hue that is desired. 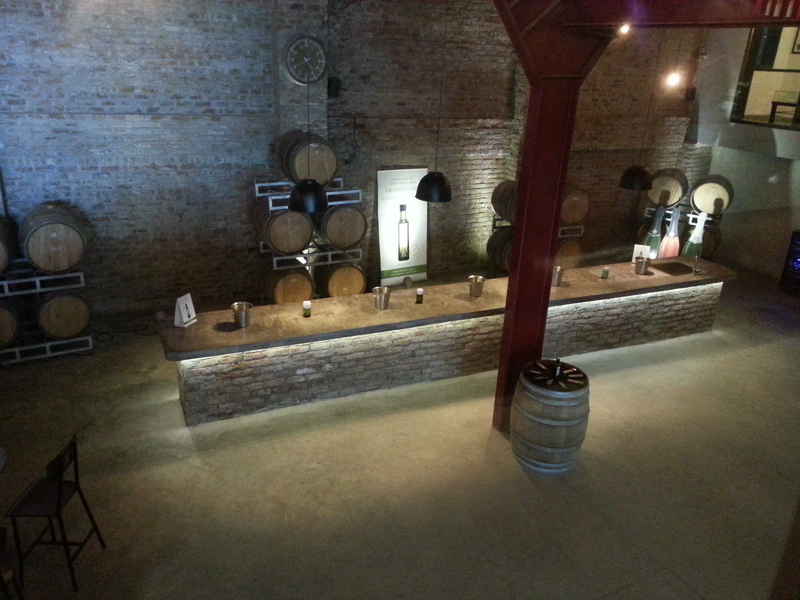 Tank halls are also used for “blending” of two wines from different regions or grape-varieties (This is where a Sauvignon Blanc combines with a Chenin Blanc to become a Chenin Sauvignon). A wine for every barrel! The next step is to “barrel” the wine for its storage. Barrels are just as important as the wines that they store. 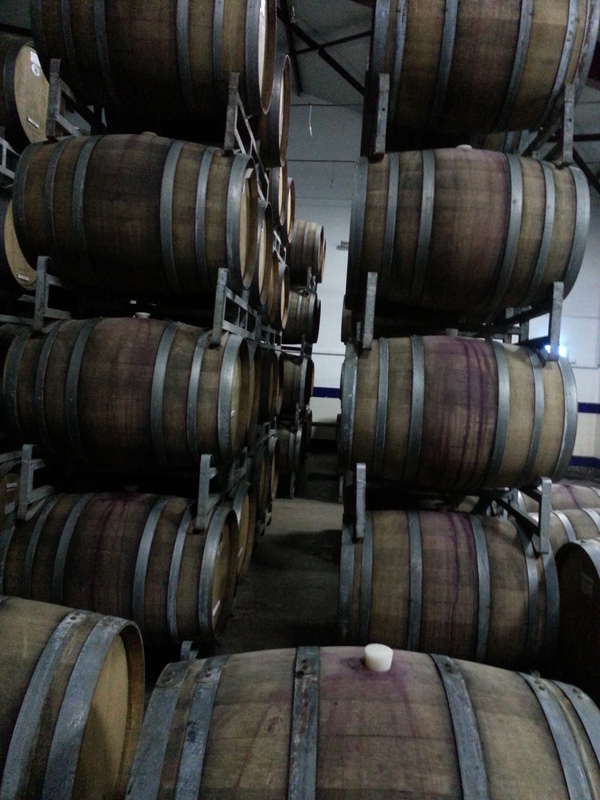 Sula imports its oak barrels for the wine-maturing process. This stage also helps in “clarifying” the wine so the tannins and other insoluble matter can settle at the bottom. The barrel-room is the last area your wine visits before it’s bottled and shipped to you. After giving us a wonderful tour of the winery and regaling us with the fascinating story of how a wine is born, our guide took us to the tasting room and handed us each a wine glass. We were taught the art of tasting a wine. Before one tastes wine, one must know the correct way to hold the glass (by the stem or base of the wine glass, and NOT the bowl) as this impacts your view of the colour and the temperature at which you finally taste it (holding the bowl of the glass heats up the wine and affects the flavour). After you have your grip in place, you must look at the wine and its colour. The colour reveals a lot about the age of the wine. Young reds have a purplish or bluish tint whereas their mature cousins are deep red or orange. Likewise, new whites are green to light yellow, and they age towards a golden hue. There’s a wine for every occasion! 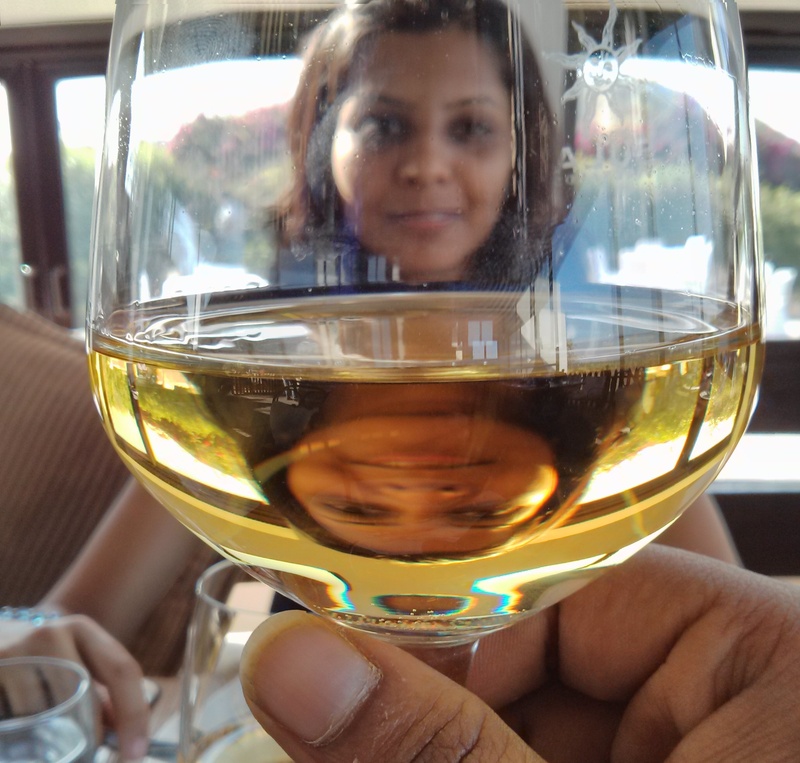 After observing your wine, swirl it in the glass to let some air mix with it. Aerating the wine enhances its taste so much so that we now have mechanical and battery operated aerators that are used for pouring wines. After aerating, smell the aroma, take a sip and keep it in your mouth for a while for the flavours to reach you. The gulp that you take after doing “all of this”, will make you realize it is worth the effort. Most novices tend to drink their wine like they would their beer or whisky which is why first-timers rarely like their first wines. After you learn the art of drinking wine, you will concede that wine is a superior alcohol and quite deserving of its price-tag. The evening was turning dusky when we were done. I stealthily slipped out of the tasting room as the others soaked themselves in conversations, so I could walk over to the lush amphitheatre behind the buildings. 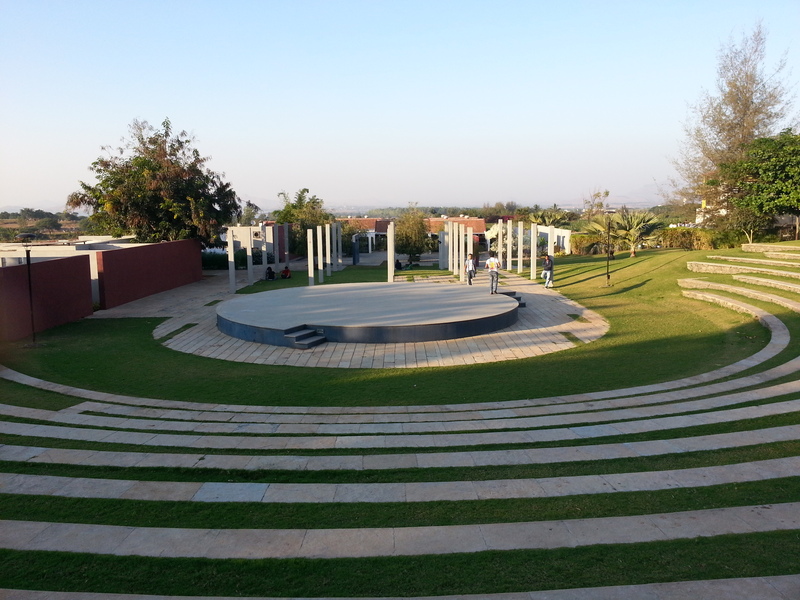 This is where music concerts are held every February during the Sula Fest. After sundown, I explored their store and bought a Rasa Shiraz, their finest vintage red which I could take back to my hotel. Dinner was an Italian affair at Little Italy, the first restaurant to open at an Indian vineyard. I downed two more wines with a mushroom starter and a plate of ravioli. People will tell you that the best thing about a food-trip is that you taste with your eyes AND your tastebuds. What you discover on your own is that the tasting first comes with your heart. Your sense organs merely act as tools. The night sky of Nashik is markedly clear as it isn’t plagued by a metro’s light-pollution. I took this opportunity to indulge in some stargazing before I bid my goodbyes to Sula.